[Updated January, 2019] Shaving cream can be pretty important: it can make using a blade a pleasant, fragrant diversion–or a painful, bloody chore. What is the best shave cream? This is an update to Sharpologist’s popular article originally posted several years ago. What Ingredients Are In The Best Shave Cream? 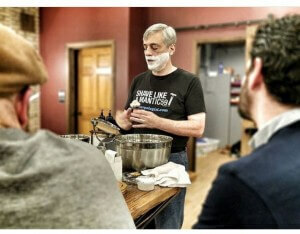 In every shaving cream formulation, each ingredient plays a role. While some ingredients are essential, others only have a minor effect. The performance of the cream serves as the ultimate test for the formulation and indicates whether the correct blend of ingredients and concentrations has been used. High tier shaving creams have a common structure that includes carefully selected ingredients that have been optimized for years. Deviations from these general guidelines results in poorer performance. Here is a typical ingredient list on a high end shaving cream: aqua (water), stearic acid, myristic acid, potassium hydroxide, coconut acid, glycerin, triethanolamine, parfum (fragrance) and sodium hydroxide. The word cocoate, usually preceded by sodium or potassium, may be found replacing coconut acid to indicate that saponification has occurred. Saponification literally means “soap making” and is a chemical reaction used to produce fatty acids from triglycerides. A triglyceride consists of three fatty acid molecules joined to a glycerin molecule, which is also released during saponification. Triglycerides are the preferred molecules used by living organisms to store fats. Stearic acid: Stearic acid is a saturated fatty acid and a surfactant (a “surface acting” chemical that lowers surface tension at the interface between molecules or groups of molecules that do not mix well) that has excellent emulsifying and lather stabilizing properties. It is also used as an emollient and thickening agent. Myristic acid: Another saturated member of the fatty acid family and is also used in shaving creams for its surfactant and emulsifying properties. Myristic acid forms intermediate bubble sizes that result in faster foaming and reduced mechanical stability. Coconut acid: Coconut acid is a triglyceride extracted from the plant Cocos nucifera or coconut palm. It is commonly known as coconut oil. When saponified, coconut acid is used in shaving cream as a source of surfactants and cleansing agents. Saponification of coconut oil produces a mixture rich in saturated fatty acids that include lauric, myristic, palmitic and stearic acids, and a small proportion of unsaturated fatty acids. Unsaturated fatty acids can be completely removed from formulation and recently have been linked to comedogenesis (a type of acne caused by cosmetics). In high concentration, unsaturated fatty acids can oxidize over time and decrease shelf life. Glycerin is a by-product of the saponification reaction. Coconut acid also is used to adjust pH, and its derivatives are used as emollients. Sodium and Potassium hydroxides: These are strong inorganic bases that are used to saponify triglycerides. Inorganic bases are also used to make fatty acids more soluble in water. Typically, fatty acids are found in shaving creams as sodium and potassium salts. The ratio in which these bases are used determines the consistency of the shaving cream for a given water and fatty acid composition. These are highly alkaline and are used to adjust pH. Sodium hydroxide is also called caustic soda or lye. The common name for potassium hydroxide is potash. Glycerin: Glycerin, or more correctly, glycerol, belongs to the sugar alcohol family. Gycerol does not have surface activity and cannot form lather. Glycerol can retain water, thus increasing lather density and stability. For this reason, glycerol is also used as a humectant (a humectant is an ingredient used to increase the skin penetration and activity time of another ingredient. They’re also used to minimize the dehydrating effect of some other active ingredient). Glycerol also increases the viscosity of water-glycerol solutions, affecting the glide of the lather. Although its effect on deeper layers of the skin remains under investigation, there is very little doubt that hydrated glycerin has a beneficial effect when applied to the outer-most layer of the skin. Triethanolamine: Triethanolamine or TEA is an organic base used primarily as emulsifier and surfactant. It is also used in shaving creams to neutralize the pH of fatty acids and to solubilize oils and other ingredients that have poor solubility in water. Triethanolamine use has been reduced in recent times because of growing safety and health concerns due to its suspected role as irritant and carcinogen and its ability to react with other chemicals to form carcinogenic nitrosamines. Some studies have linked TEA to contact dermatitis and allergies. TEA is currently under review in USA, UK and European countries. Triethanolamine can be completely removed from shaving cream formulations without any loss of performance. Determining performance from ingredient lists is often complicated because the actual contents of the product are not listed. Furthermore, ingredient lists do not include the concentration of each ingredient or their purity. This can also be problematic when troubleshooting allergic reactions. It is important to realize that the process of selecting shaving products is not an exact science and several factors, including glycerin content, scent and other additives can modulate performance. Personal preference, allergies, etc. can be important factors in the selection process. However, the best shave cream covered here that use this foundation rank among the best in the market and are known for their performance. Criteria For The Best Shave Cream? Superior performance (based on research from review sites, forums, and my own experience)–with both “cushion” and “lubrication” better than most. Ease of applying and using under a variety of water mineral content conditions (in other words it works well with both “soft” water and “hard” water). Available in a variety of scents (you won’t use even the best shave cream if you don’t care for it’s smell) or no scent at all. Availability (from more than just a single artisan website, though this is a lower consideration than it used to be due to the robust shopping experience sites like Etsy, WooCommerce, or Shopify can provide). Admittedly these criteria are somewhat arbitrary but I want a way to more objectively narrow the field down. An “Honorable Mentions” list of products that I think deserve attention but don’t meet all the criteria above is also included. I have a separate article about the best shaving soaps. Since most of Sharpologist’s readers are in the United States I will concentrate on products available there. Remember, “Your Mileage May Vary” (YMMV) with these recommendations! Although there is a large majority that like these creams there will always be some for which a product does not work as well. I plan to update this post regularly as products enter and leave the market. Some product links go to a “choice page” (geni.us links) where you can select where you would like to purchase from. Note that Amazon, Beau Brummel For Men, OneBlade, Truefitt & Hill, and West Coast Shaving links are affiliate. What Is The Best Shave Cream In The Mass Market? I’m going to distinguish two different categories of results–products available in the mass market, and high-end lathering products available in specialty retailers and online. First, a look at mainstream products you might find in your local supermarket, “big box” retailer, or drug store chain. Unfortunately, most of the mainstream shaving products are, relatively speaking, poor performers (all other things being equal). Most are in pressurized cans and filled with chemicals that try to compensate for the skin-drying effect that propellants can have. If you have no other choice than to use a mass market shaving product, at least try to use one that comes out of a squeeze tube. Available in several scents (I think the Peppermint, Menthol and Tea Tree Oil version is particularly excellent for the summer) and unscented, Cremo shave cream is widely available, found in many national drug store chains, grocery stores, and “big box” or “megamart” outlets. HERE is Sharpologist’s review of Cremo shave cream but you should be able to find a number of confirming reviews with a simple internet search. Cremo also has a lathering cream as well, made specifically for use with a shave brush. shaving cream. Sharpologist reviewed it a while back and it is great stuff. What Is The Best Shave Cream In Specialty Distribution? Castle Forbes shaving creams have a reputation of being strongly-scented: I like to say that using their Limes shave cream is like getting hit in the face with a key lime pie 🙂 . Without a doubt a luxurious product with outstanding performance (and commensurate price). Cyril Salter – The “youngster” (!) of the classic British shave product lineage, having been around since “only” the 1940’s, Cyril Salter is still often mentioned in the same breath as the Trumper/Truefitt/Taylor gang. Salter’s Vetiver shave cream was the only game in town in that scent up until just a few years ago, and all their creams give off a classic vibe. Check out Sharpologist’s mention of their Rose shave cream. Esbjerg Shaving creams are still relatively unknown in the US but have been around for 35 years in Europe and have a number of interesting shaving cream scents (plus unscented). It performs extremely well for me, with lather that is not only voluminous but also lubricating, cushioning–and it worked really well in my hard water. Availability in the US is expanding. Executive Shaving out of the UK has had their own brand of shave creams out for a couple years now, and with my tweak of the listing criteria they are getting some deserved attention. New York Shaving Company (NYSC) shave creams performs right up there with the big boys. Their scents are a mix of classic European, “old timey” American, and natural scents. They also have a sample pack! The “Tonsorial” shaving cream is a favorite of many (including me). Here is Sharpologist’s review of the Brooklyn shave cream. Another British brand now in the US. I call St. James of London shave cream scents “traditional with a twist:” Mandarin & Patchouli, Cedarwood & Clarysage, Black Pepper & Lime, Sandalwood & Bergamot, etc. Performance is excellent across the line. The Art of Shaving – A possibly controversial change here on this update. Some may say it deserves to be on this list, while others will say it should not be on the list at all (though mainly for more emotional, “part of a giant conglomerate” reason I think). The line-up recently expanded to include more interesting scents. My personal opinion is their shaving cream performance is maybe it’s not quite as good as it used to be before a reformulation a few years ago (and not a particularly good value). But I think Art of Shaving creams are solid performers and their fairly wide availability makes it a “gateway drug” into good shaving! Truefitt & Hill shave creams are a good mix of “natural” and cologne-like scents, some popular with younger men (1805, Ultimate Comfort) while others are more classic (Trafalgar is one of my all-time favorite scents, though some consider it–as well as Grafton–an “old man” scent). The No. 10 cream is meant to be used brushless but is “brush friendly” anyway. For myself Truefitt and Hill creams may be ever-so-slightly less cushioning than other creams in this category but I think the difference is subtle. Most agree the performance is excellent: here is my review of the Apsley shave cream. Trumper shave cream scents tend to stay in the classic, conservative realm. Some scents may seem a bit foppish but you might be surprised how downright masculine a Rose or a Violet scent can smell. In any event, almost everyone considers these shaving creams as superior in their performance. Baume.be started in 2011 by a software engineer who was plagued by overly-sensitive skin. He developed his own aftershave balm and a year later a shaving cream as well, made specifically for those with sensitive skin. Beau Brummell For Men – Scented with a mild Sandalwood-and-something-else note, Beau Brummell’s shave cream is an excellent performer, right up there with the top-shelf British creams in my opinion. It lathers easily and luxuriously, even in my hard water, and the “cushion” aspect is exceptional for me. The post-shave feel is also quite good. If there was more than a single scent this cream would be on the main list. Here is Sharpologist’s article about their grooming line. Burke Avenue – Burke Avenue is getting a ton of “buzz” for it’s quality and performance. Many say the post-shave moisturization is exceptional, though it comes in a single (mild) scent. Here is Sharpologist’s article about the background of this product. DR Harris – Another old-school English shaving cream with interesting scents (Arlington is a personal favorite of mine) and they perform very well. I actually think their shaving soaps are even better than their shaving creams but the creams are still very good. – Available in a single scent but can be used either with a brush or brushless, Jack Black Supreme consistently gets excellent reviews. Jack Black Beard Lube is also very good. – Lucky Tiger’s “Liquid Shave Cream” is reasonably available, in a single (mildly citrus) scent. As the name implies it is less firm than many other creams (I think it has a consistency of an aftershave balm) but the performance–with or without brush–is a stand-out among its peers. Nancy Boy – New to the list. Originally with only a single scent, Nancy Boy added a couple additional scents a few years ago (all their scents are very mild). Limited availability but great performance (with or without a brush) and they have an excellent reputation in the wet shaving community. OneBlade – OneBlade’s “Black Tie” shave cream is only available in a single, moderately-strong lavender scent. But the performance is excellent: the ‘cushion’ aspect is particularly noteworthy. Taconic – Taconic has a relatively new line of shave creams in a pump bottle that remind me a lot of the Wm. Neumann creams. Their original shave creams are quite good as well. Taylor of Old Bond Street – Another possibly controversial change on this updated list. They have dropped from the main list on this update because the performance of TOBS shave creams seem a little inconsistent in my opinion: the most-recent launches tend to perform really well, while many of the older formulations don’t perform as well. Taylor’s shave creams have a wide variety of both classic and modern scents. Sandalwood is a often listed as a favorite shaving cream on Amazon. While I think they might be at the bottom of the top shelf, they’re still on the top shelf! The Traditional Shaving Co. – Check out my recent review of the line. There are a number of other shave creams that I’m keeping an eye on for possible inclusion in a future update. Some are relatively new to the market. Others have had a recent change in their business circumstances. Some have recently changed their formulation. And some are here simply because I don’t have enough information for a full evaluation yet. Did I miss something? Disagree with a rating? Leave your suggestions and comments below!